Minty Spring. Weird title? I know! At least, it was better than my previous title idea - Minty Fresh! Haha! Fernando said that it was like a peppermint candy or something and laughed! Yes, he laughed at me. Well, but he actually came up with better title than me. Anyway, if you read from some of my previous posts, you might know that mint is one of my favorite colors. It seems like one of my sponsors noticed that, Vedrana from StoreV sent me an amazing bracelet. Look at how beautiful it is! 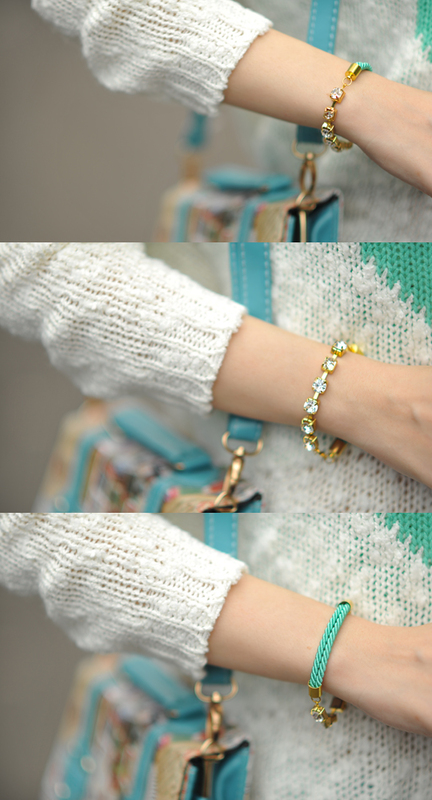 Besides the color, I love how I could wear this bracelet in two ways. For glamor effect, just show to the world the pretty rhinestones. And for casual effect? I would rotate it and let the world see the mint twisted rope. What's not to like, right? The bracelet was actually the main point for me to create this look. It made me remember that I hadn't worn my LOVE sweater since I bought it and the color really matched with the bracelet. So, I decided to go mint all the way. Btw, I already chose my pre-wedding gown and where we will take the pictures. It's still in Indonesia, but truly wonderful place. I can't wait to tell you all about it. But, it has to wait until May. We haven't decided the date yet, but soon. Gah! I have to start working out and eat healthy. LoL. 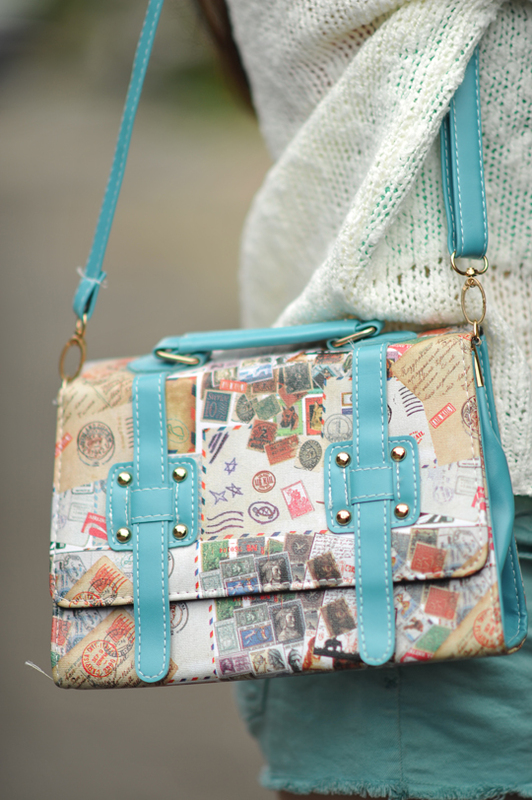 Mint is really perfect for Spring! We love mint color!!! Amazing sweater!!! Love that bracelet! So pretty and love how it's like two bracelets in one. 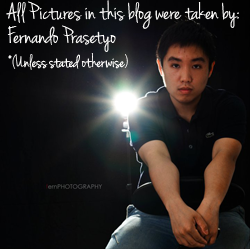 So what is a pre-wedding shoot? Is that similar to engagement photos here? uuuu ce Carol adorable banget! BTW what a cute look. I love mint and that sweater!! I bet you will be a beautiful bride ever! I'm in love with that jumper, lovely! I'm loving these pictures, you look so cute! love the mint color ! I love your top! the heart is so cute! This outfit is seriously perfect!! I love the mint, the crown, the socks, EVERYTHING! 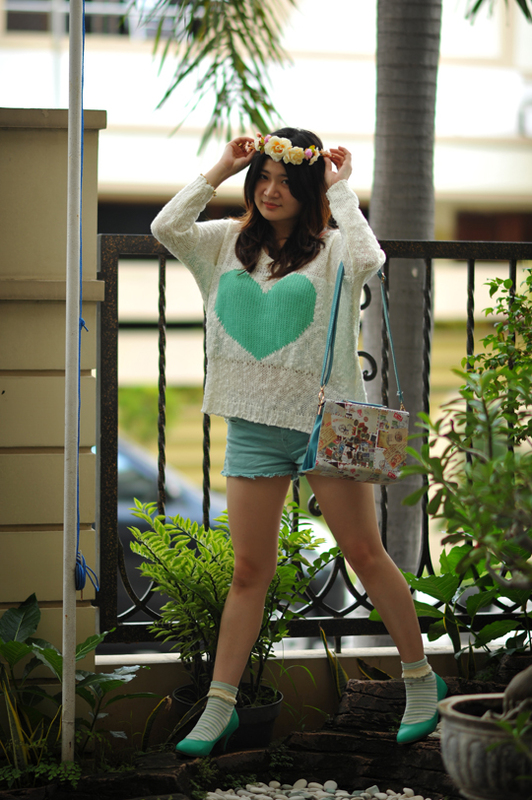 I love mint color and i loved your outfit! Mint has really taken the fashion world by storm, and rightfully so, because it's a beautiful colour. It suits your complexion as well, and I like how you accessorised your look, particularly, the bracelet, ring, and heels!